Deftly skewering an assortment of ingredients and then searing them on the grill makes for attractive presentation. Francesco alternates colorful vegetables- some raw, some cooked- with fish, and lightly coats them with bread crumbs before grilling. He uses long bamboo skewers that have been soaked in cold water and threads the food on pairs of them, a tip worth remembering. “With two skewers the food will not spin around and is less likely to fall off,” he points out. 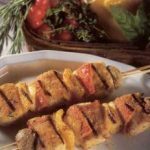 Bamboo skewers are better than metal ones because they do not conduct heat well and will not cause the fish to overcook. First place 8 long bamboo skewers in cold water to soak. Finely chop the garlic with the herbs, season with black pepper, mix with the bread crumbs, and side aside. Remove the stems from the mushrooms. Place the mushroom caps in a small saucepan with the lemon juice and enough water to cover. Bring to a boil, then drain immediately. Set aside. Core and seed the peppers and cut them into 2-inch (5-cm) squares. You should have 16 squares of pepper. Trim any skin from the swordfish and cut the fish into 12 uniform medallions, about 1½ x 2 inches (4 x 5 cm). Wrap each in ½ strip of the bacon. Peel the roasted garlic cloves. Peel the onion, quarter it and separate it into layers. Preheat a grill or broiler. Thread the ingredients, just slightly off center, on each of 4 skewers, starting with a mushroom cap, then a roasted garlic clove, then a chunk of bacon-wrapped swordfish, taking care to put the skewer through the bacon as well as the fish. Follow with a square of red pepper, a piece of onion, and another square of pepper, a chunk of swordfish. Continue with pepper, onion, pepper, swordfish, garlic, and mushroom. 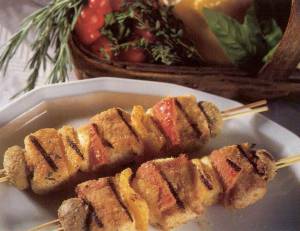 Insert a second skewer about ½ inch (1.3 cm) from the first in each brochette. Repeat with the remaining skewers. Lightly season the skewers with salt and pepper, brush with olive oil, and roll in the bread crumb mixture to coat lightly. Grill or broil the skewers 6 to 8 minutes, turning them as they brown.